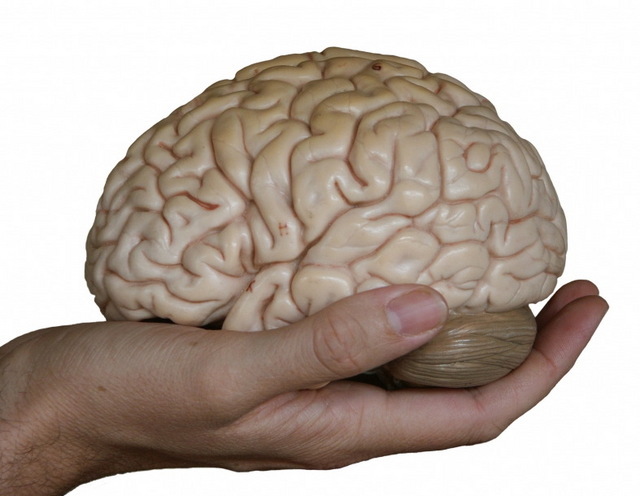 Learn how Your Hands may guide Your Brains to solve a Problem! These conclusions, of a new study by Alibali and colleagues—Robert C. Spencer, also at the University of Wisconsin, and Lucy Knox and Sotaro Kita of the University of Birmingham—are augmented by another, counter-intuitive one – even when we are solving problems that have to do with motion and space, the inability to use the body may force us to come up with other strategies, and these may be more efficient. The findings will be published in an upcoming issue of Psychological Science, a journal of the Association for Psychological Science. The study involved two experiments. The first recruited 86 American undergraduates, half of whom were prevented from moving their hands using Velcro gloves that attached to a board. The others were prevented from moving their feet, using Velcro straps attached to another board. The latter thus experienced the strangeness of being restricted, but also had their hands free. From the other side of an opaque screen, the experimenter asked questions about gears in relation to each other—e.g., “If five gears are arranged in a line, and you move the first gear clockwise, what will the final gear do?” The participants solved the problems aloud and were videotaped. The videotapes were then analyzed for the number of hand gestures the participants used (hand rotations or “ticking” movements, indicating counting); verbal explanations indicating the subject was visualizing those physical movements; or the use of more abstract mathematical rules, without reference to perceptual-motor processes. Alibali, who is also an educational psychologist, asks: “How we can harness the power of action and perception in learning?” Or, conversely: What about the cognitive strategies of people who cannot use their bodies? “They may focus on different aspects of problems,” she says. And, it turns out, they may be onto something the rest of us could learn from. The Language of the Hand in Schizophrenia! 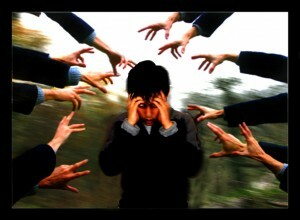 Schizophrenia is a complex mental disorder which affects about 1% of people worldwide. People who suffer from schizophrenia experience problems perceiving the difference between real and unreal experiences – which results in psychotic experiences. And as a consequence schizophrenic people also are not able to think logically, to have normal emotional responses, and to behave normally in social situations. The hands become involved as well, because people who have schizophrenia typically also have impaired hand movement coordination. Even brain experts are not sure what causes schizophrenia, but there is plenty of evidence which suggests that the brains are involved. One of the most common is the dopamine hypothesis which attributes psychosis to the mind’s faulty interpretation of the misfiring of dopamineurgic neurons. 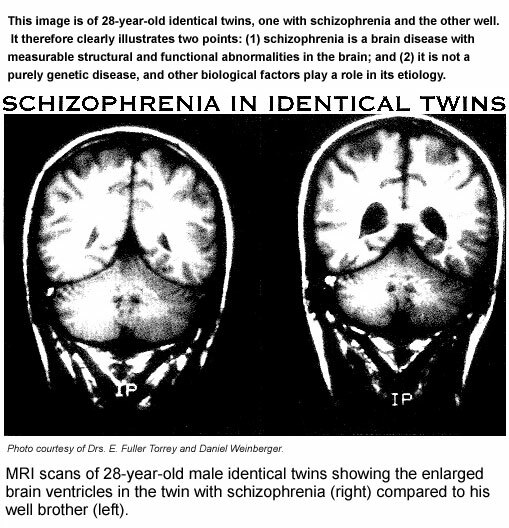 In the picture on the right presents the skull of twin persons of which one (right) is suffering on schizophrenia. It is fascinating to see the elonguation in the brain skull of the twin-person who suffers on schizophrenia. A likewise tendency is typical for the hand in schizophrenia, which tend to be long & slender! Atypical handedness is much more often seen among schizophrenics (20%) vs. controls (3.8%), which implicates that people who suffer on schizophrenia tend to develop ambiguous preferences for different tasks. Also they tend to developed impaired hand-motor performance, right handedness is in schizophrenics often featured with non-right eye preference. 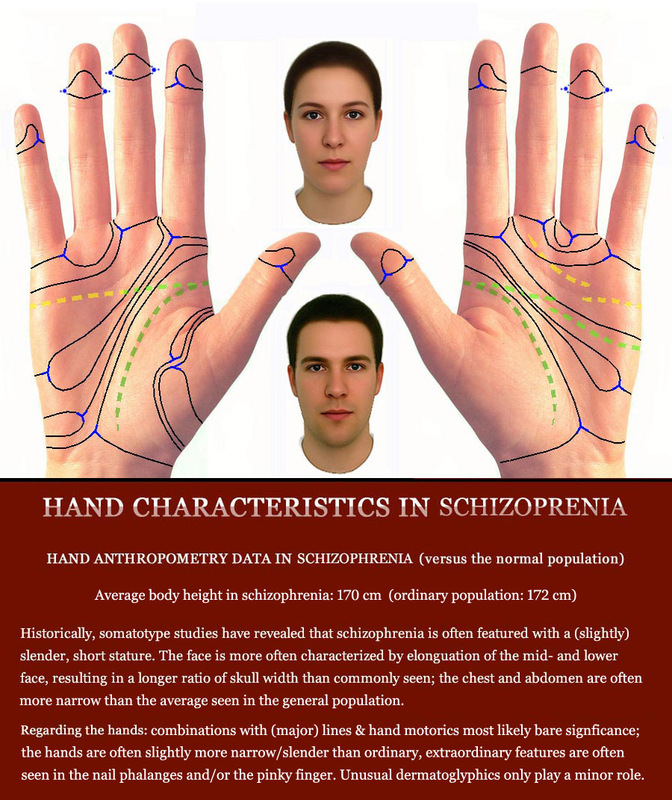 The hand in schizophrenia shows a large overlap with common hands, however in all perspectives of the hand ‘minor anomalies’ are seen much more often than in the general population. An overview of some of these typical characteristics is displayed in the ‘phantom picture’ for the hand in schizophrenia, see the picture below. However, it is not easy at all to identify a person who suffers on schizophrenia solely via a palm reading! In order to recognize the hand of a schizophrenic person, the presence of significant hand characteristics in at least 4 perspectives of the hand is required. Both the palmar dermatoglyphics & fingerprints and the major hands lines are required to show assocatied characteristics. Plus two of the other five perspectives of the hand are required to be involved as well. Phantom picture for the hand in schizophrenia.